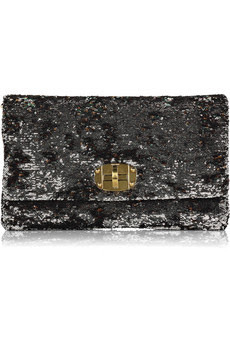 I think this Miu Miu clutch is so fantastically fun! The sequins would add a bit of excitement and a lot of glamour to any look. The only problem is, I think it is a bit overpriced, $995 for sequins?! I understand paying money for leather but I really have a hard time understanding high prices when the item is not leather. That being said, I would love to carry this bag for an evening out with my friends. I'm not even really a fan of sequins to begin with and that is way, way too expensive for them. Not my style, but amazing for evening - definitely will make an outfit pop! and i appreciate the sweet comments, means the world! Gorgeous but, way too expensive. i like the almost... destroyed? look. not sure if thats the right word, but whatever. and honestly, i feel like 99% of the time its the designers name you're paying for. sadly, I'm totally into the whole fashion hype, and now those prices seem, if unattainable, somewhat "reasonable". if that makes sense? i love that clutch, but im way to broke to buy it! awesome clutch, but a bit expensive no? !